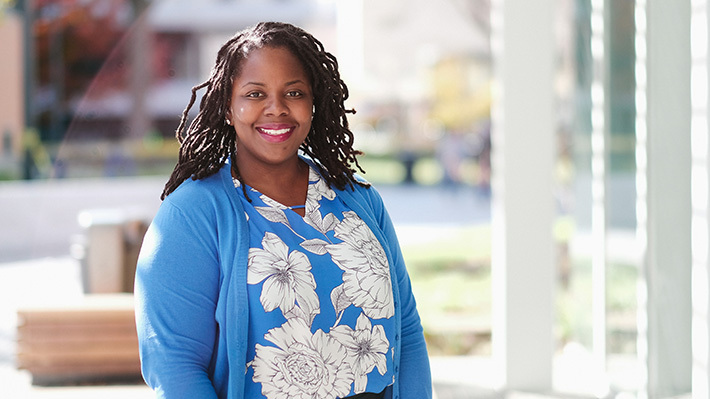 Aquiera Halsey credits Drexel LeBow with helping her transform into the dynamic and polished professional she is today. From using her international business degree during study abroad in Istanbul to discovering her niche through her co-op experiences, Halsey says that without those experiences, she wouldn’t have the skill or tenacity she has today for using data analytics to drive improved care outcomes. Halsey chose Drexel LeBow with big plans. Having started her own bakery business at age 11, Halsey began classes majoring in entrepreneurship and legal studies hoping to broaden her horizons and expand her business into a chain. “I felt that if I studied entrepreneurship and learned the fundamentals of business then no one would be able to take my business away from me, even if I decided to do something else with my life,” she says. The opportunity to merge her studies with her love for culinary arts came when Halsey was set to begin her co-op. Having applied to an Aramark position in Denali, Alaska and making it to the second round of interviews, Halsey was anxious to get a jumpstart on her culinary career. But after a late offer from the company and an offer from Thomas Jefferson University Hospital, Halsey made the switch to healthcare. The new position proved to be the right choice when tragedy struck in her family. “Five months into my new role as a Data Coordinator, my grandmother suffered a stroke that August. If it were not for my newfound friends in healthcare, and the fact that I was still in Philadelphia, I wouldn’t have been able to help my grandmother,” she says. Halsey’s experience atThomas Jefferson University Hospital catapulted her commitment to an advanced career in helping others. The work she did during co-op paid off and her first job after graduation was in the same department at Thomas Jefferson University Hospital. While working in her new position, Halsey decided to pursue a Master of Public Health. “I wanted to increase my knowledge in the medical field and combine that with business so I minored in statistics,” she says. Halsey’s professional experience post-graduate school includes management roles in acute care hospitals and consulting with national quality improvement firms. In late 2018, Halsey elected to return to acute care where she could directly impact change. “Today I serve in a role that is part business where I use analytics to operationalize innovative ideas. I’m also part clinical because of my ability to analyze clinical charts. Lastly, I’m part IT because I engineer care delivery databases to meet the needs of those caring for our most vulnerable patients,” she says. Halsey says every aspect of her experience at Drexel LeBow helped prepare her for her mission in healthcare. From serving as a resident assistant, overseeing the Business Learning Community to using the knowledge acquired through her international business studies. “If it wasn’t for Drexel I wouldn’t have the confidence lead analytics in such a high-stress, high reward environment.” Halsey passes on her wisdom as a mentor to high school students in her beloved city of Philadelphia.